No, indeed we did not. As I told you, based on your conduct, our dialogue was over. I hope in years to come you will appreciate a life’s lesson in this affair. That is what a university experience is all about. I know we didn’t end our last meeting on the best note, but we’d be happy to try and get a fresh start and meet again to discuss divestment sometime this term if you’re willing. Let me know. Great, we are in agreement then, no more dialogue. When I asked you all why you were meeting with the president, the response I got was to learn his personal thoughts about this issue. As is indicated by [UO Divest undergraduate student] below in [pronoun redacted] email to the president’s office, and just as you three did with me this morning, this is about pressing your argument for divestment even though you have already received responses from all parties involved. I offered an olive branch to you all last meeting and was the basis for today’s meeting. You all chose to ignore that and continue to beat the same drum of divestment. I don’t appreciate being lied to about your intent of meeting with the president and I don’t appreciate your not honoring the reason for meeting today with me. As a result, you have now lost the opportunity for further dialogue with me. I’m mystified as to why Namyet didn’t want the students to talk to the President of their university, but whatever. The University of Oregon Foundation is an independent, non-profit organization that exists for the sole purpose of supporting the academic mission of the university. We carry out our mission through prudent investment management, maximizing the value of private gifts for the benefit of the university and honoring donor intent. Our strategy is to invest in a diverse set of smart, longer-term investments. This approach has created a well-diversified, progressive portfolio whose performance ranks in the top 10 percent nationally of all university endowments. Our philosophy and approach are guided by making prudent, socially and environmentally responsible investments that advance the financial objectives needed to support the university’s academic mission. We are proud to lead the Pac-12 in adopting the first ever environmental, social and governance considerations to help inform our investment decisions. We believe that green energy initiatives, such as solar and wind power, sustainable forestry, and organic farming will steadily replace investments in carbon-based fuel sources, and we do not have any investments in coal. We intend to let those carbon-based investments –which were initiated many years ago– expire without renewal, ending our investment in carbon-based fuel sources. Our responsibility is to balance financial support for today’s students, faculty and staff, with those of future generations at the university. We are currently providing more than $45 million each year in direct student, academic and operational funding to support the academic growth of our university and students. We are pleased that with our approach, we continue to successfully deliver on that mission. Why so nasty? The word down at the faculty club is that the Foundation’s got some money stuck in a disastrous tar-sands private equity deal, and can’t find a buyer at a price that won’t make them look ridiculous. Bit late for that, really. Lovely bride, but she really should look into the groom’s finances. Oh, right, the secretive UO Foundation is still delaying release of its required annual reports to the IRS and Oregon DOJ. And I’d advise a pre-nup covering any potential defamation lawsuits from the Foundation – they’ve got a nasty history of that sort of thing. 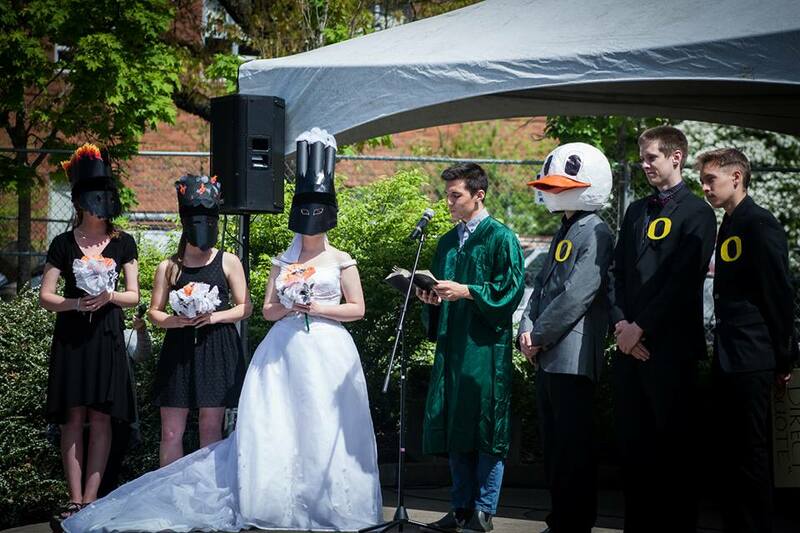 The bride was lovely in a white dress, although she wore a three-smoke-stack hat and represented the coal industry’s betrothal to the University of Oregon Foundation, which as groom, was represented — of course — by a duck. She carried a $100 bill bouquet. The mock wedding Thursday at the EMU Amphitheater was staged by Divest UO and other climate action groups protesting the UO Foundation’s refusal to drop its fossil fuel company holdings. UO Foundation CEO Paul Weinhold has said the foundation doesn’t make investment decisions based on social causes and strives to get the best return on its dollar. At the mock wedding, the “foundation” best man said: “This union is about maximizing returns in a beautiful way,” according to the Daily Emerald student newspaper. Part of the speech was a parody of recent communications between Divest UO students and UO Foundation Chief Investment Officer Jay Namyet. An earlier meeting between the two ended unhappily, according to an email chain posted on the uomatters.com blog. [below the break.] Students pressed for divestment, while the foundation offered to let the students help research alternative investments, according to the e-mails. Student organizers first started discussing a disinvestment plan two years ago. The UO’s Faculty Senate unanimously supported the student’s proposal in 2015. Student groups are asking private donors to give their money to a nationwide divest fund. It’s a tax deductible donation, and the money will go to the UO Foundation if its organizers decide to divest by the end of 2017. Jung said the donations would go to the school’s general scholarship fund. As of Thursday, the foundation wasn’t changing its stance. More on the “Divest Fund“. Make a donation to the Divest Fund for UO scholarships, and they will hold it in escrow until the end of 2017. If the UO Foundation’s Jay Namyet has divested by then, UO gets the money. If not, it is divided among those universities that have divested. Someone knows their game theory. I tried it out, and they even sent a receipt for my taxes. Here’s how the UO Foundation treats our students. The emails are posted with permission, although I’ve redacted all student names anyway. In a nutshell, in April 2015 the UO Divest students met with UO Foundation Chief Investment Officer Jay Namyet. He did not seem willing to seriously consider their arguments for divestment, so they set up a meeting with former Interim UO President (now Provost) Scott Coltrane. Someone in Coltrane’s office sent Namyet the students’ request for a meeting with Coltrane. Namyet forwarded it to the students and called them liars, for reasons that make no sense to me. Yes we were planning on getting his personal opinion on the issue, because as of our meeting with you we weren’t aware that he had come out against it, although we had a strong feeling that he would not publicly come out in support of divestment because of the pressure he’s under and because he had yet to contact us or make any statement about it following the senate vote. Yes, if he is opposed to it we will express the reasons that we feel like it is proper to support divestment, in the same way we did when we presented our case to the senate, and the sam way we did to you. I don’t see how this is news since we are representing the “UO divestment campaign”, and all parties involved know what our overall goal is. away from fossil fuel investments as they destroy at an accelerating rate the planet and the lives of millions of people, and you refused to even engage in any phrase involving the word ‘divestment’. one’s not coming up with compromises and that we ‘lied about our intentions’ is astounding. discuss with us real solution that will put pressure on the corporations that displace them, and fuel extreme weather which kills countless others, reflects this. However I’m sure many of the few dozen wealthy donors and people above you will be pleased with the precedent of not taking a principled stand on any social cause, no matter how valid the grievance, or how dire the consequence of collective inaction, as taking such a stand may set the dangerous precedent of doing the right thing while marginally impacting returns. During the civil right’s movement MLK articulated that it was not the KKK or explicit racists that were the greatest barrier to progress. Rather, it was otherwise good people who acknowledged the injustices of the era but choose not to act meaningfully out of fear that it would impact their privileged position. This was the position of the University in the 80’s during apartheid divestment, and it is the position that you articulated for the foundation again today. I may have been naive, but I really did believe when I choose to come to the UO that it was an institution committed to social and environmental justice, but these meetings have shown me that this is not the the commitment of the foundation. Needless to say we do not want “the opportunity” of speaking with you again so long as the foundation’s position is one that avoids taking a principled stand against any injustice because doing so may marginally effect the interests of those benefiting from the status quo and the subsequent destruction which follows that inaction. b) Review the statements of support we have received for divestment from the campus community, including a campus wide student vote in support and a unanimous statement of support from the University of Oregon Senate. We would like to bring 3-5 persons to the meeting. Tagged divestment, UO Foundation. Bookmark the permalink. I think all of this is part of a long-term strategy to transform the image of the University of Oregon, starting with killing off any past associations of the University and its students with anything reeking of social responsibility or engagement with the real world. Any hint of social responsible investing, then, must be nipped in the bud. Instead, the University’s long-term strategy is now marketing itself to dimwitted, physically-fit Californians whose ideal University is a mindless health spa. The perfect agent of this is our so-called “board”, consisting of former track stars, B-list media figures, sports marketers, timber executives, and passive law professors, all led by a Ben Carson supporter. What, we have a long term strategy? Where did that come from? At least there are some grown-ups at this university. Keep pushing, students. In the meantime, the foundation will keep on riding its investments in coal companies down to zero. Reads like a CIO tantrum. Childish. Not the sort of constitution one should have to interact with a vibrant socially active campus. Perhaps Namyet thinks he needs coal to diversify and reduce risk, a la Markowitz. Which is sort of funny, given that energy stocks are the classic pro-cyclical play. He’d do better investing our students scholarship funds in booze and fast-food stocks. If even a weak version of EMH holds, shouldn’t the marginal return to investing in fossil fuels be zero or near zero? The Foundation’s financial reliance on carbon seems to indicate that Namyet is just really bad at his job. I hope the faculty and students practice what they preach. No oil and gas stocks, etfs, mutual funds, etc. The real life lesson here is that standing up to a bully will get him to show his true colors and that he’s always right. The corollary life lesson will be that the university is going to back up this bully and his rightness. Jay is a good man, even if this email exchange sounds to be at the tail end of what became two sides frustrated by each others inability to see the merits of the other side’s argument. The simple fact is that university divestment campaigns have no impact on the desired outcome (to reduce fossil fuel use in the world). Once those shares are on the public market, buying or selling them doesn’t impact the capital accounts of the fossil fuel companies. These university divestment campaigns are nice and showy and allow activist students to feel like they are doing something, when in reality, they aren’t. They would be much better off running campus campaigns to reduce the DEMAND for fossil fuels. How about focusing on leadership and campus operations for more LED lighting, biofuel vehicles, locally sourced foods in dorm cafeteria, energy efficient building renovations, car-pooling….that has more impact. You can be sure all investors will abandon declining growth stocks (check out coal companies this year). Chasing after UOF to change up a tiny portion of (probably indexed mutual fund) holdings in their relatively small overall portfolio ($1B is not a lot in the foundation/endowment space and not worth mentioning in global capital markets) isn’t meaningful. Perhaps it’s too much to expect the Foundation’s $400K a year CIO to maintain the same level of professionalism in his communications as do UO undergrads. The theory of public goods covers this pretty well. There’s no hypocrisy here. Reducing CO2 emissions is almost certainly a non-rival non-excludable public good. As with any public good, voluntary efforts to provide it, such as walking back home for spring break to reduce emissions, will suffer from rational free-riding even among those who have a strong preference for the good. The normal solution to this market failure is collective action. Our students are engaged in that collective action by trying to limit the ability of fossil fuel producers to raise capital, therefore driving up their costs and reducing CO2 emissions. The fact that the students are personally using goods and services that emit CO2 at the same time they protest is entirely rational. They’ve got a limited amount of time and effort to devote to CO2 reduction, and they’ve decided that the payoff from devoting this time and effort to collective action to reduce CO2 exceeds the payoff from individual efforts. This is the same logic that drives countries to work for global agreements to limit CO2 at the same time that they are maintaining or even increasing their own emissions. These countries, and our students, are willing to adopt policies that will limit their own emissions (by increasing costs of airplane travel, for example) but only if others are also going to do so. I agree the exchange became a bit too blunt for my comfort too. But guessing there’s more than meets the email eye here as I know Jay is very reasonable and modest person. That he makes the salary he does is somewhat irrelevant (except perhaps to UOM – high salaries earned by others does seem to be a particular irritant in this forum). In the world of university CIO’s with his performance record, Jay is a real bargain. At least in his case, we can see the wealth creation for the UOF that justifies his salary and benefits us all. Could it be the case that his reasonableness and modesty are a function of how he perceives the rank of the person he’s dealing with? Imagine him behaving this way with Schill or Lillis. I’m sure Jay is a perfectly pleasant chap when he’s out on the golf course with his buddies who are trying to sell him private equities. And I thought the finance people were the ones complaining about politically correct language. What special word does he want the students to use when talking to him? Guys can be so sensitive. What a line. I’m going to start using this on creepy guys at bars. and telemarketers. I do not know Namyet but there is nothing in the email exchange that would give me concern. Are types of students beating this drum the loudest the ones bringing sound investment analysis to Namyet’s table? Didn’t think so. I suspect he gave them (or at least tried) more of an education than they get elsewhere on campus. If they lied, they lied. If that’s true, I admire him for saying it without the protection afforded by tenure. If that’s not, that’s another story. Thanks for submitting this uninformed and pointless comment. You have now lost the opportunity for further dialogue with me. Many of these oil and gas firms are big investors in renewables.